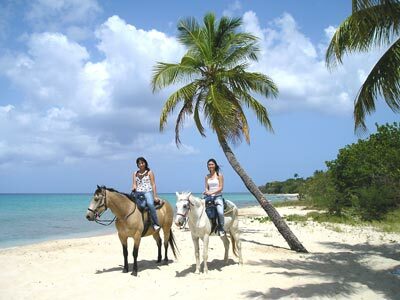 "Equestrians should head for St. Croix. Paul and Jill's Equestrian Stables at Sprat Hall Plantation are the premier stables not only in the Virgin Islands but also in all the Caribbean. 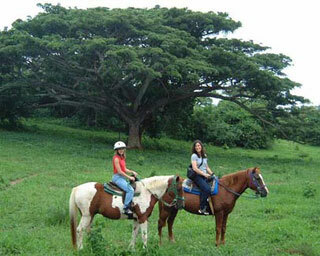 The outfit is known for the quality of both its horses and riding trails. Neophytes and experts are welcome." 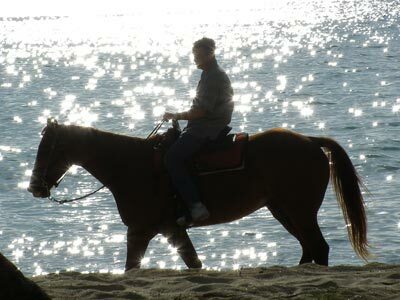 Our best tropical trail ride is not complete without a ride along the beach. We have a picture stop to preserve the memory of the beautiful white sandy shore, the blues of the sea, and the picturesque coconut trees rising tall in the background. Jill will be happy to snap each individual group's photos with their own camera. This ride also includes a nature tour to the rain forest, through the ruins of an historic slave village, then across the country pastures with gigantic Rain Trees, plus scenic hill top views. Approximately a 1.5 hour tour, with an extra half-hour for check-in and mounting. Rides are available for families with little kids or older folks. Private rides by special request can be arranged at additional cost with several days notice (but are unlikely to be available around holidays). Kapok trees - their pods containing silk cotton were originally used to stuff life jackets and pillows. Mahogany trees - used in crafting furniture. By chance we may see a Mongoose or two -- which ate all the snakes, our V.I. Bird - the banana quit, red tailed hawks, mountain doves, guinea hens, iguanas, deer, zebra butterflies, awesome millipedes. The finest horses are owned and managed by Paul Wojciechowski and Jill Hurd. Jill, of Danish descent, was born and raised on St. Croix and has been riding the hills for years. She can tell you about the history of the islands; the flora, fauna, and a host of facts about St. Croix to highlight your vacation. Unlike the rest of the Caribbean Islands, U.S. Passports are NOT required for U.S. citizens travelling to the USVI! RIDE PRICE IS $100.00 PER PERSON. Specific ride departure times fluctuate during the year due to changes in season and time of sunset (the USVI does not observe daylight sayings time). Your specific arrival time will be identified when you make your reservation. PLEASE DO NOT ARRIVE EARLY as it is completely unnecessary given that we have built-in time allotted for check-in and mounting, departure being approx. 30 minutes after the scheduled ride time. During the OFF SEASON (usu. Aug-Oct) rides are mostly scheduled only once per day. On CRUISE SHIP days only, if the morning ride is already full and there is sufficient demand, we may open an additional mid-day ride at 1:30 PM. For our rider's safety we strongly recommend against pregnant women or infants participating on the ride. We Do Have a Height/Weight Limit. If you have had any recent surgery, injuries or physical or medical difficulties, inform us when booking, not when out on ride. Allergies - take medication before arrival. Bring tissues anyway.